Ye shall receive power, after that the Holy Ghost is come upon you."' We are entitled to it, bless God. We are glad to see some of it and wish, bless God, that we might see a great deal more. And beloved, I have a splendid conviction in my heart that we will. I want to read some familiar verses, as a basis of thought. Those of us who are familiar with this scripture will remember that Peter is very careful to call attention to the fact that Jesus wasn't referring to him as the one upon which the Church was to be built. He speaks in the second chapter of First Peter of how Jesus Christ is the great foundation and is established upon the apostles and prophets, Jesus Christ Himself being the chief cornerstone, etc. Foundation laying is always a hard process. Over here in the East, with your solid ground, you are not so badly as some cities in the West, Chicago, for example. Chicago is built on a great quicksand bed, which is from seventy to eighty feet deep. After the great Chicago fire, the board of aldermen did a thing that no body of men had ever dared to do till then. They passed an ordinance raising the grade of the city sixteen feet. In sections of the city where the old buildings still stand, you go down a story and a half from the street level to the original street. It was a tremendous undertaking, but it got them everlastingly out of the mud. So sometimes a destructive process is good. The Chicago fire became the great means by which the new and wonderful city came into existence. I want to talk to you today about foundation building. When I was a young man I was a builder. I looked upon Chicago as the great Mecca of all builders, so I got to Chicago as quick as I could. I looked around among various occupations and I settled on this fact: There were two classes of men always in demand: the man who understood scientific foundation building, and the man who understood scientific roofing. And I said, "I will master these two things." In those days, they used to build twelve story skyscrapers, sometimes fourteen. Foundation building was not known as it is today. In those days they went to the forests and brought great pilings, seventy, eighty, and ninety feet long. These were driven into the ground until they touched bedrock. At the surface, these were cut off level and railroad iron laid on top. Then they commenced their stone work on top of the railroad iron, and after they got to the street level it would probably be brick. I lived long enough to see that these great buildings would get out of plumb and it would be necessary for a civil engineer to go over the buildings every three months to see whether they were moving out of plumb one way or another. If they were, great systems of jackscrews were used under the buildings to adjust them. It may surprise some of you to know that some of these great buildings in Chicago would literally stand on a system of jackscrews, which are adjusted every three months by civil engineers. That was too much like hanging a city up in the air, so they said, "We will drive great steel castings down to the rock and we will take out the earth and fill the castings with cement." That system likewise passed away. And now they excavate clear down to the bedrock, four or five stories if necessary. The quicksand and mud is removed. The foundation is laid on the base rock. For the Church of God and Christian faith to become strong and to be built up in God, it is necessary to get a good foundation. It is a greater problem with most builders to get the old rubbish out of the way than to do the building. If we will look at our own lives, we will observe this: that the things that have been rooted and grounded in our hearts - some tradition of the Fathers, some of it misconception of the meaning of the Word of God; much of our teaching is fragmented - these form the greatest obstacles to the engrafting of the living Word of God. Every one of us who have progressed in God have found that the difficulty was not in believing the Word of God, but the difficulty was to get away from things that were settled in our own being as facts, though untrue. How hardly have we struggled over the matter of, "If it be Thy will," concerning sickness. From our babyhood and all down through the generations, we have been taught that if you are sick, the proper thing to do is to pray, "If it be Thy will," forgetting all the time that the Lord has forever demonstrated and declared His eternal will concerning the subject of sickness by healing all that come to Him. Well, bless God, some have succeeded in getting over that difficulty and put the subject, "If it be Thy will," behind their back and moved out where they believe the declarations of Jesus Christ. So it was that victory came on that line. Now dear ones, the thing that the Spirit of God is laying deeply upon my own heart these days is the need of a settled, established state in the Lord Jesus Christ, and the movement of the Spirit worldwide is to bring into unity the children of God who will raise A Standard of Truth for the World. to ourselves, but I see that this movement, that we supposed was local, is a general movement, and of the Holy Ghost, and it is in your heart just as it has been in ours." So God is moving in these days on a certain definite line. The man who has a settled, established faith in God has got that faith based on the eternal declarations of the Lord Jesus Christ and is moving in harmony with the revealed plan of God as outlined for this hour in God's Church Plan. The difficulty with most individuals and teachers in times past has been that the revelation of the mind of God, as revealed in the Word, was limited to such a degree that they were compelled to take only a certain few of the great principles of the Gospel, and thus their entire system was based on them. But in these days, as the coming of the Lord approaches and as the added light of the Spirit has been given, God has revealed in a larger way, in a broader manner, the truth. So that in these days it seems to me it is the purpose of God that the Church of the latter day, the Church of Philadelphia (if you like), should be based upon the great broad basis of the eternal truth, as laid down in the New Testament by the Lord Jesus Christ and the apostles, not on any fragmentary principles. In days past, it was thought necessary to endeavor to bind men's hearts and consciences to certain established truths that the Church was ready to accept. And so these truths were usually embodied in the form of a creed, and they said, "This is all of truth that we accept. This is our faith." So they laid this basis and built a fence around themselves. After awhile, to the amazement of the Church and to her discomfiture, it was discovered that their creeds have been the means that squeezed them in, and instead of being a foundation broad enough for the Word of God, they are strangled inside their unyielding creed and there is no room for expansion. When the dear Lord has wanted to give a revelation of progressive truth, He has been compelled to go outside of the Church fence and raise up a new body. That was because a fence had been built. A certain little enunciation of truth had been collected and the structure established on that instead of on the entire Word of God. We can see this: The individual who learns truth these days cannot confine it to certain declarations of doctrines. For as the days go by we see the progressive light of God, and if you were to compare your faith now with what you believed ten years ago, you would find there has been a great expansion. Now what is ten years more going to develop? What truths will it be necessary for us ourselves to accept from the Lord in the coming days? Consequently, beloved, there is only one basis upon which the Church of Jesus Christ can rest: That is, upon Jesus Christ and the apostles and the whole body of truth as outlined in the New Testament. Then, beloved, in that great body of truth there must be the accompanying largeness and Spirit of the Lord Jesus Christ who didn't confine Himself to certain little dogmatic teachings, but He laid the great broad principles upon which the whole great kingdom of heaven rests and upon which a great Christian life can rest eternally. There never was a teacher like Jesus. He was the one great Mastermind who understood the Spirit of the living God, who understood that all revelation of God was a progressive revelation. And thereby the minds that He must prepare by His own personal teaching were not able to receive all the great body of truth He had to reveal, so He said, "Ye are not able to bear it now."' They had to grow up into the place in God where they were able to bear and analyze and utilize the greater truths of the Word of God. Now, beloved, we are in the place, just that place, bless God. I believe in my heart that God is laying, even in this little company with her one hundred and twenty like the church at Jerusalem, the foundation of the truth of God that will command the attention of the Christian world. Yesterday I received an invitation from E. N. Bell, Editor of Word & Witness, Malvern, Arkansas. In April they are having a great convention down there that includes all the Southern states. 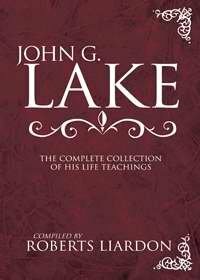 Among other things he says, "Brother Lake, there are two contending forces; the one which desires a strong organization, the other which don't want any organization, but desires to be a law unto themselves." As I read the letter I said, "They are both wrong." The man who is an anarchist and is a law unto himself and don't put himself into line with the Word and cooperate with God according to God's plan is just as great a sinner as the other who comes along and wants to organize the Church into a frozen, man-created mass. Jesus Christ laid down the principles of eternal truth: Every man who accepts the principles, who lives the life, is acceptable to Me. So, beloved, the Church of God these latter days must just return to the blessed basis that the Lord Jesus Christ laid down. Beloved, the day has long gone past when men's consciences can be bound with certain little doctrines. If we were to take this audience today, of those who are living holy lives, baptized in the Holy Ghost, and note carefully what this brother believes and that brother believes, we would perhaps have twenty different statements before you got through with this little company. So the dear Lord, in these days, is once again moving upon the hearts of men that the body of Jesus Christ shall be brought together in holy oneness, that the power of God may be poured upon her, that the Spirit of the living God may move through her in mighty power and demonstration, and that through her the last message of this present age may be given to the world - the great kingdom message. Bless God. It seems to me we are only beginning to understand with what force the kingdom message is going to come and its revolutionary character. A few weeks ago the country was stirred by one man's endeavor to just touch in a small way the first principle of Jesus Christ, that first one, "Blessed are the poor in spirit."' I refer to Henry Ford, the manufacturer of the Ford Motor car. He set aside out of his profit, ten million dollars for 1914, to be divided between his twenty-six thousand employees. He established a minimum wage of five dollars per day to be the wage of every man. Then every two weeks, he would receive in a check the proportionate amount of the ten million dollars, in addition to his wages. We say, "Bless God, that is a good thing." That's a starting point. It indicates that some men are beginning to see the mind of the Lord. It is not by any means a fulfillment [illegible]. Then the selfish man says, "Yes, that will draw to Henry Ford every expert workman in the United States, etc. and his profits thereby will only be increased, not lessened, but it is a start." Now see, the blessed principles of the Lord Jesus Christ are the principles of unselfishness. That is the one crowning principle that the Lord Jesus Christ wants to lay down in His Church this very day. It makes no difference how it is applied. The Lord Jesus Christ Himself didn't undertake to tell us how to apply that principle. He left it to every man in his own station. But, beloved, the demand upon us is that we live that blessed principle of the Lord Jesus Christ. Beloved, these are the things that God calls us back to today: to the original basis, to the foundation - Jesus Christ Himself the chief cornerstone. We see these blessed principles exemplified all through the New Testament by the apostles themselves, who as the fathers of the Church, were desirous that they should not even become a burden on the Church and endeavored to keep themselves from being a burden. And with their own hands in some instances labored that they might have the privilege of living and preaching the blessed Gospel of the Lord Jesus Christ. Don't you see, beloved, that every departure from the principles that the Lord Jesus has laid down has weakened the great fabric? Out of that condition has grown our divisions. All our departure from the principles of the Lord has robbed us of that vital faith that was necessary to get answers from God, even for our daily bread. A return to the principles of the Lord Jesus Christ, to the practical life of the Son of God, will bring again upon our souls the blessing of God. Beloved, that's the entrance into power. That's the final manner of testing the spirit. The spirit must ever be tested by the Word of God, by the principles of Jesus Christ; the law that He laid down by the commandments of Jesus. If the spirit in you won't measure up with the principles that the Lord Jesus Christ laid down, be sure that it is not the Spirit of the Lord Jesus Christ. If the spirit in you exalts itself, etc., just settle it. There is a spirit there that isn't like the Spirit of the Lord Jesus. The way we can see what His Spirit was like is from the principles He laid down and the life He lived. I feel it this day that the Lord is going to pour a rich and wonderful blessing upon the saints when we come down and return to the blessed principles of the Gospel of Jesus. If I were to advise you to do anything particular during the coming weeks it would be this: Take the fifth, sixth, and seventh of Matthew and read them and reread them on your knees, until the principles of Jesus Christ enter into your heart. Then, bless God, there will be a good basis laid in your soul for the everlasting blessing of God. It is as impossible to get the eternal working power of God to appear in a man's life, or the life of the Church, until first the clearing away is done and the rubbish of petty doctrine and littleness is taken out of the way, as it would be to build a Chicago skyscraper without first taking out all the quicksand and mass of rotten stuff. It has got to come out. It has got to be cleared away. When the life goes down on the eternal Rock, Jesus Christ, then the structure will come up and will stand in the power of God. So this morning I pray God that He will help us this day to take these blessed words of God, the declarations of Jesus Himself as He has outlined them in the fifth, sixth, and seventh of Matthew especially, and get these real basic things settled in our soul. I have received during the week applications from several persons who want to come up here and receive membership into this body, who desire to receive the right hand of fellowship. You can't keep it from growing, from developing. But O, beloved, is it going to develop in God or is it going to be like every institution has been or is it going to be placed on eternal foundations? And is our life going down into the bottom, to the bedrock, to the foundation stone of Christ Jesus? O God, our Father, let our lives be once and forever and for all settled on the eternal Rock, Christ Jesus, Lord God, where our lives shall stand. Blessed be Thy name! And where the Church of Jesus Christ shall stand, Lord God, and the gates of hell shall not prevail against her. Blessed be Thy name! O God, let that deep, true, holy, unselfish working of the Holy Ghost in our lives be so pure and true and real that, my God, there shall not be left a superficial thing in us, Lord, but that our character shall be opened wide, opened to the living God, and wide open to one another. O God, reflecting, showing forth the real life of Jesus Christ. O God, we bless Thee for this day. Lord God, there is an echo of gladness in our soul. There is a shout of praise in our hearts. Lord God, the day has come. Thine appointed hour has come when Thou hast really begun to call together into one body the body members of Jesus Christ whose names are written in heaven. Lord God, we worship at Thy feet, and Lord, we declare our faith in Thee, the Son of God, this very day. Thou art going to bring forth Thy people, Lord God, the Church of Jesus Christ, bless God! Who shall give forth to the world the message of the kingdom. Bless God! Who shall raise up a banner of truth and demonstrate a righteousness that men of God will not have to be ashamed of. O God, we pray Thee then, that the great virtue of Jesus Christ shall be so inwrought in us that, my God and Father, we shall look with love into the face of every other man. That, O God, our Father, we will have the eves of Jesus in us and the heart of Jesus in us in such a way that we will not see things that are evil, but O God, we will see the good in the man. We will see the purity, Lord, we will think of the things that are lovely, Lord, and are true, Lord. We will be so pure and clean before God that the light of God and the life of God shall shine in us and flow through us so that mankind will be blessed. O God, our Father, we rejoice in this day. We rejoice in this hour. Thou art the Son of God, Lord Jesus. We are so glad You have let us live at this time of life. My God, we rejoice in the expectation of Thy soon coming. Bless God! But O Jesus, blessed Jesus, get us ready, get us ready. Lord God, get us ready to give the message that is going to stir the world. Get us ready, Lord, to receive the power of God that is going to demonstrate Christ to mankind, for Jesus' sake. O God, we pray that upon this Pentecostal Movement worldwide and upon the Church of Christ at large, by whatever name it is known and upon the hidden ones who are known by no name, the power of God shall come. Lord God, once again let the pulsating movement of the Holy Ghost be felt through the body of Christ. Lord Jesus, draw Thy children together, Lord. Lord Jesus, establish them on the rock. Lord God, build up the body, we pray Thee, Lord. And bless God, we pray that upon our own souls these days there shall be such a passion of the Christ-heart that we will seek the lost, that we will seek the sick, that, my God, religious life, religious service shall forever cease to be a matter of religious entertainment. But O God, make it what Your heart desires, religious service, serving our fellowmen. O God, shedding Your tears with the afflicted, putting Your hands under the weary, lifting them up to God, praying for the stricken ones. O Christ, let the pure heart and Spirit of Christ throb in every breast for Jesus' sake, that the will of God may come, that the prayer of Jesus Christ may be answered, that we may all be one. Lord God, that Thy kingdom may come and Thy will be done in earth as it is in heaven, Lord, for Jesus' sake. Amen.